Random Vegas - The largest Megabucks Jackpot ever won in Las Vegas was $39.7 million at the Excalibur in March of 2003. The winner was a 25 year old man who came to Vegas for March Madness. He invested $100 into the machine and turned it into 1.5 million over the next 25 years. This week’s winner goes to @24k for his picture of Cosmopolitan at sunset. This is one of the best pictures I’ve seen of the actual Cosmopolitan building. Both towers and the casino exterior are captured in the shot all lit up. Since the picture was taken as the sun was going down, you still get to see the silhouette of the back tower which, like the Luxor, can virtually disappear at night. 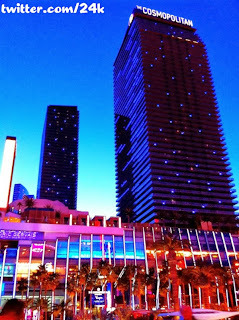 I love this picture, I love the Cosmopolitan and I can’t wait to get back to Vegas.